First of all we need to understand the telecom market in Brazil. Oi is the third largest telecom company in Brazil and south America. Oi was formed when government decided to merge state owned smaller telecom companies during privatization of Brazil telecommunications system. Oi brands include: Oi Fixo (fixed telephone landline services), Oi Movil (mobile services), Oi Velox (ADSL 3G), Oi Internet (ISP), Oi Wi-Fi, Oi TV, Oi VOIP. 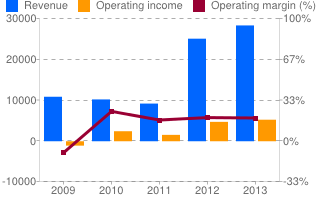 Oi acquired Portugal telecom in 2013 and as it turn out that it was not a very good deal financially. Not every company is successful in mergers and acquisitions specially when the sold out company does not clearly discloses it’s liabilities. Similar things happened with this merger. Portugal telecom lost in billions due to its bad bet to acquire another company. This fact was it came in news was hidden from Oi officers and they did not take this into account when making offer. The result is company had to suffer financially. Second, there were political disturbances in Brazil which increased pain for the company. As it happens people take panic and start selling. The end result was that stock fall down beyond expectations. However, we believe that Oi is survivor. As it is indicated by company management in recent months that they are aggressively looking to gain more market share and attempting to acquire other companies. For some reason their deal to acquire assets of Italian telecom company did not go well. That’s all right. Some other opportunity will come along. It does not mean that people start taking panic and loose trust in company. As we know that company is taking all necessary steps including reorganization to make sure that they want to be on profitable track again. We believe in Oi! Its just time and very soon we hope that stock will hit back to its peaks. Now, lets see what consumers say. We have done some research and found that their customer service is excellent which is a good factor to attract more and more consumers and they also have very competitive rates for their services. The Brazilian and Portuguese operations continued to add total subscribers with approximate 75 million in Brazil and 13.1 million in Portugal till to date of writing. There may be some competition from GVT now specially when it acquired assets of Italian company Telefonica. However this is not to be take too much to worry as Oi has deeper market penetration and user support. It will take more time to get GVT complete. The only worry for Oi is its liabilities. Oi management is doing all their best to Oi’s debt. Due to bad financial deal of PT telecom, Oi seem to be struggling for now in terms of finances. WE also have to look another factor that there may be some possibility that other telecom company may buy PT assets and repay back PT’s debt. If that happens then who knows within days Oi stock bumps up to its highest. Think about it! Now let’s see at financials of the company. Oi’s current market cap is about 5B USD, EBTID margin 27.94, ROE 11.9. There can be upward trend found in total revenue in last 3 years. The profit margin is on declining trend. That is because of company is buying other companies and some bad debts. Net income growth is last 3 years is about 14% and on upward trend. Total equity is almost unchanged since last three years. Since there are long term debts which can be a risk. 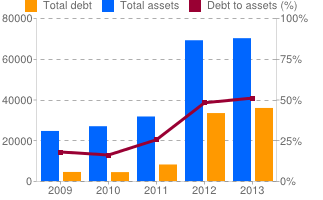 Company’s debt to asset ratio is about 50 percent which is a sign of worry. However as we said earlier some bad decision company had taken recently which is penalizing balance sheet. Nevertheless Pt deal was not that bad either. It added more customers to company’s existing customers base. And sooner or later company will benefit financially because of more subscribers. Company’s cash flow is in good conditions for next 3 years and by that time it will accumulate more revenue to pay back its long term debts. In Brazil, Oi now has more that 18 million lines in service making it the largest fixed line provider in Brazil. Its wireless operation, Oi movil has more than 50 million subscriber and continues adding more customers and Oi is the fourth largest cellular provider with 18% market share. A final note, since company has a very large base, any company who wants to strengthen their presence in Brazil and South America with money on hand may be very much interested in buying out Oi telecom if Oi is not able to pay back it’s liabilities, for example Amêrica Môvil. We recommend to buy this stock (NYSE: OIBR) and hold it! !